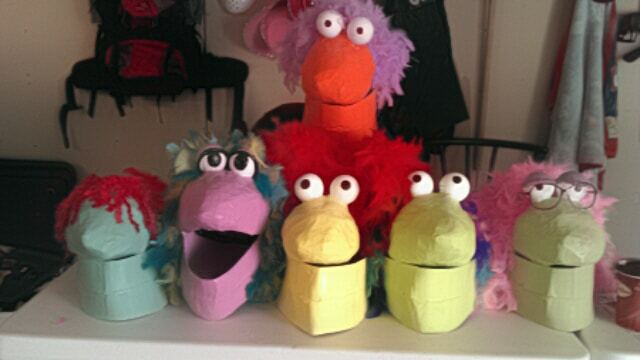 Hey Jonni, I made these paper mache Fraggle Rock characters for my friends and myself to wear out to a club for Halloween. It was a real treat trying to figure out how to make them wearable but with a little brain power I was able to do so successfully. I used baseball caps sized to my friends heads to build from. 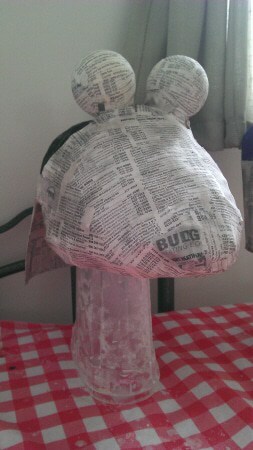 I then stuffed a plastic bag with newspaper to get the shape of the beak. taped that onto the peak of the hat. I then attached 2 Styrofoam balls to the top for eyes. Then taped cardboard from a cereal box around the bottom of the hat along the back.. stopping at the edges of the peak of the hat. Next I made a bottom jaw out of more cereal box cardboard but didn’t attach it. 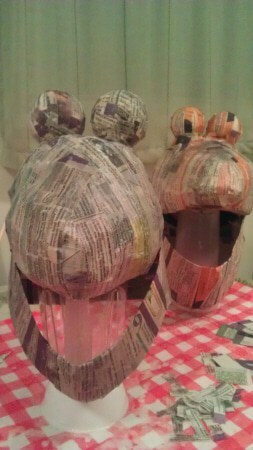 I then used the paper strips and paste to paper mache 4 layers. Next I painted it with acrylic paints, varnished it. Then attached the bottom jaw with fasteners so it can move. Finally I bought some feather Boas and hot glued them on for the hair. 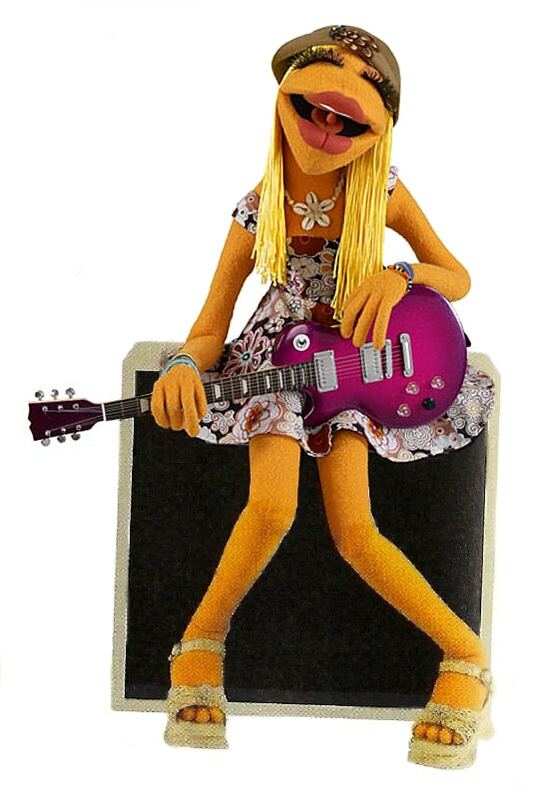 The masks slip over the head like helmets and your face perks out of the open mouth of the Fraggle. I will post a couple of pics of us in full costume on a later date. For now here are a few pics of the process. I think they turned out great and my friends and i had a wonderful time decorating them together on the weekend!!! I think they turned out great, too, Jennifer. Thanks for showing them to us, and showing how it was done. I think these costumes are going to be a huge hit at the party! These are so fun – and lots of fun to decorate together, I’m sure. And even more fun to all wear to the party!! I’m having a great time seeing all these halloween creations. Glad folks are submitting. 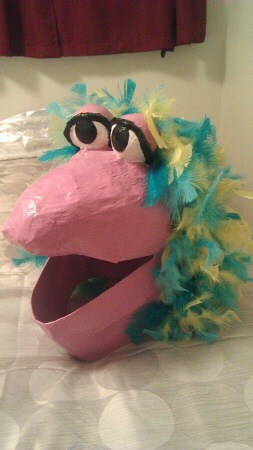 A few questions: I’m making a muppet mask (Janice) and this idea will work perfect! I’m gluing fur over the mask. Hope this doesn’t sound too ridiculous, but does the baseball cap become part of the mask?? My school does the Polar Bear Plunge every year to raise money for Special Olympics and we have won the costume contest every year!! Last year I was Jiminy Cricket and made my costume the day before, except for the hat!! Love your masks but want to make sure I get it right! !